I recently announced the availability of a Giraph code generator for Henshin, which allows you to execute graph transformations in a parallel and distributed manner. It is important to know that there is a fundamental difference in the execution semantics of graph transformations in this approach. Concretely, the application of rules is always maximum parallel, i.e., every rule is always applied to all found matches in parallel. The idea behind this is that we want to enforce the use of parallelism already at the modeling level and to make it hard for developers to use conventional sequential algorithms that cannot be parallelized automatically. For example, the rule AddTriangles below would be applied to all found triangles in parallel. 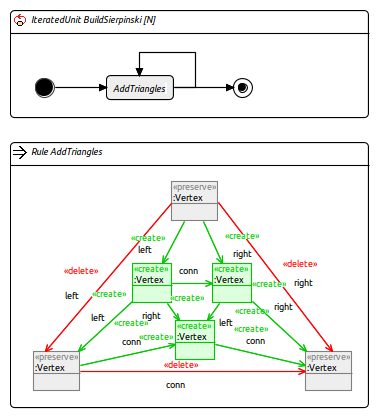 Executing the iterated unit BuildSierpinski to a 3-node triangle therefore generates the full Sierpinski triangle of depth N.
Due to the change in the execution semantics of rules, other existing and also some new modeling concepts specifically tailored for parallel graph transformations become important. For example, vertices and edges with <<require>> and <<forbid>> stereotypes are particularly useful to avoid overlapping matches which could result in inconsistent parallel rule applications. We also introduced concepts that allow you to aggregate over attribute values of all found matches. I will discuss this in more detail in another post.